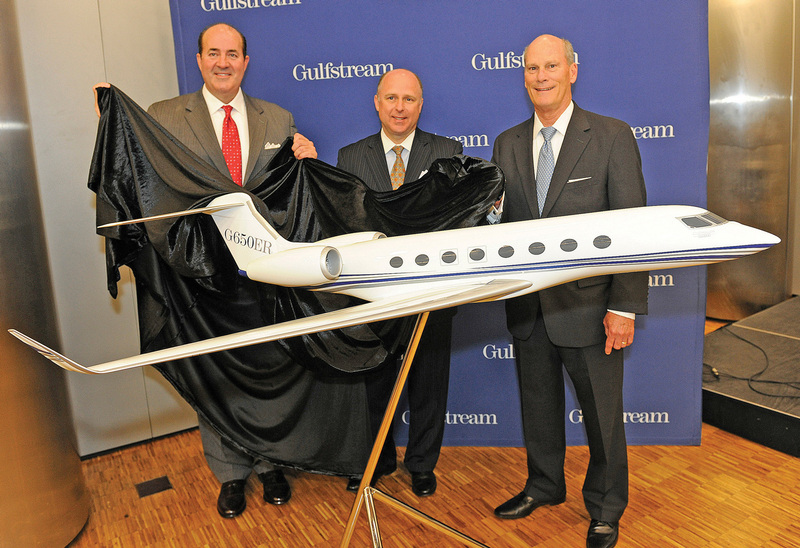 Ultra-long just became ultra-longer after Gulfstream president Larry Flynn revealed yesterday a new addition to its successful family in the shape of the G650ER. As its name suggests, the aircraft is an extended-range version of the G650 business jet. The G650’s already lengthy range figure of 7,000 nm is extended to a 7,500 nm at a cruise speed of Mach 0.85, which will make it the longest-ranged business jet in the world when it receives certification. Alternatively, the ER version can reach out a further 400 nm beyond the baseline G650 to fly 6,400 nm at Mach 0.9. Such performance opens up yet more attractive city-pairings. Gulfstream has already flown a demonstrator of the G650ER, and in one flight it covered the 7,494-nm ground distance from Hong Kong to New York in just 14 hours 7 minutes, flying at Mach 0.865. The demonstrator also flew nonstop from Los Angeles to Melbourne, and with the G650ER northern Australia will be attainable in a single flight for the first time from western Europe. Increased range can also be traded for extra speed and payload. Compared to the G650, the ER can cover a 7,000-nm sector in 30 fewer minutes by using its extra fuel capacity to fly faster. Over the same distance the G650ER can carry a 4,000-pound payload, considerably more than is possible with the G650. Maximum operating speed is Mach 0.925. The only real performance penalty for the G650ER is an increase in balanced field length at maximum weight, up 500 feet to around 6,360 feet. Surprisingly little modification work is needed to turn a G650 into a G650ER. In the original design of the aircraft sufficient space was left in the wings to add extra tankage for 4,000 pounds more fuel, without having to resort to auxiliary tanks in the fuselage. Despite maximum ramp weight rising from 100,000 to 104,000 pounds, Gulfstream had already built in adequate structural margins in the G650 to handle the ER’s weight increase. The engines remain the same Rolls-Royce BR725 turbofans, but the fuel quantity measuring and flight management systems have to be tweaked through software to cater for the extra tankage and performance changes. Although Gulfstream opened the orderbook for the G650ER here at EBACE, it still has to gain FAA approval for the type. This is expected later this year, in time for initial deliveries in the first quarter of 2015. EASA approval should follow in 2016. As well as new-build aircraft, the ER configuration is available as a retrofit option for existing customers. Downtime for the work to be performed is less than a week.